Have you ever driven in really thick fog? We live near the Mississippi river, where a lot of tributaries feed into the waterway. I didn't grow up in this region (I'm a native Texan), but what I find is that certain mornings of the year, the hills and valleys surrounding our home become blanketed in a thick fog. It becomes so heavy over the roadways that in order to drive, you have to put your headlights on the low beam and drive very slow. You can't see anything. All of the curves and turns seem to sneak up on you. What were once familiar roads become scary and unknown. It can be suffocating because you have no point of reference. I also get very impatient when I drive in fog. I don't like not being able to see so I find myself turning on my high beams, thinking I can see further ahead but instead I am just blinded even more. The early months after disclosure from infidelity are not for the faint of heart, no matter which side of it you find yourself. As the unfaithful party, there were many times I wrestled with the lie that it might just be best for my family if I left. Driving off of a cliff, overdosing, or disappearing seemed like much better options than facing the devastation I created. I had caused enough damage. In my shame and despair, all I could see was that I was someone who could destroy people. My deceit caused mass destruction and my betrayed husband couldn't stand to look at me at times. What does early recovery have to do with fog? Nothing of which I am about to say is profound. In fact, it is so bread and butter basic that it might border on being insulting. I have learned that when you drive in fog, all you can do is stay in your lane, keep your beams on low, and go very, very slow. If you are reading this and find yourself in the first six months following disclosure, buckle up. You may be desperate for any sign of hope. Often, there won't be any. If they are there, you might not be able to see them through the pain and chaos surrounding you. You have no perspective. You will drink coffee out of the same coffee pot as you did before discovery, but everything seems so vastly different and out of place. Your entire life can seem to be a horrible episode of the movie Groundhog day; only difference is there is no rewind button and certainly not a control+alt+delete option. Most of the time all you can do is stay in the mess. Face the mess. Expect to drive in fog for a while. The days will seem to crawl and never end. It will feel oppressive and you will be convinced the sun will never shine again. I know in our story, it would often seem to get more awful as time went on. The deeper we looked behind my behavior, the uglier the story got. The more pain my husband faced, the more he would find ways to protect himself from the pain. But like a deep, ravaging infection, a lot of the toxins must be removed before healing can take place. We would try to go to a movie or dinner to escape the pain only to be knocked back down to a place of hopelessness and despair. I saw a side of my husband I had never seen before. I heard him say things I had no idea he would be capable of saying. I saw a rage and anger (rightfully so…pain will do that to a person) that I had no idea how to respond to. I saw him withdraw from me, the kids, his hobbies and friends. Nothing I said seemed to matter. Everything I did or said seemed like the wrong thing. I often felt like I was damned if I did, and damned if I didn't. I know you might hear things like: your spouse wishes you were dead, they hate you, or that you should just leave. Pain can create a lot of confusion and I couldn't see that at the time. Here's the irony. Just as I did and said things in my affairs that now make me shudder in disbelief, I have to bestow the same grace to my husband. I needed to give him time to sort out what he felt about the bombshells that seemed to be coming at him from every direction. Feelings are a funny thing. They aren't always true. Some feelings are fleeting. Some are deeper. Some are just completely irrational because sometimes our beliefs about ourselves are based on lies. Looking back, I am so grateful we both found a way to simply stay in our lane. To keep driving. 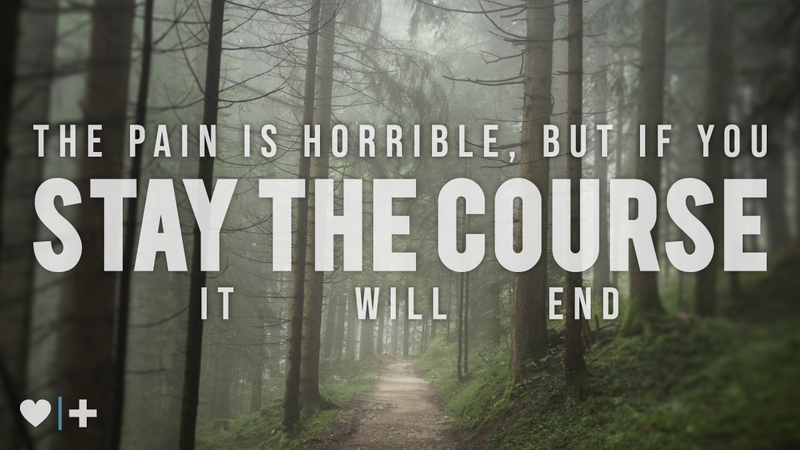 To know that the pain is horrible but if you stay the course, it will end. It might not be as quickly as you hope, but will not be as long as you fear. If you are in the early months and any of this rings true, there is a community at AR that can't change the choices that have been made, but we can help you walk through the pain. I love this analogy. Spot on. Thank you for reading. I hope you find something encouraging in your journey today. I can relate to this. Living in a winter wonderland, sometimes being able to see when driving while it is snowing, it’s all blindingly white. Driving forward slowly looking for the reflectors on the side of the road is the only way to know that I am are still on the road. It’s very slow going, I am very focused on staying on the road. I want to get to where I am going, although it would certainly be easier to stop at this point. I’m looking for safety as I keep going forward ever so slowly. Stopping isn’t an option since I am already driving in the snow storm. There are also the hazards of others who are doing the same thing trying to get to safety. Where, when and how do you find safety from the storm? Keep going forward? Stop at the closest gas station? Wait for the snowstorm to end? How long is that going to be? All good, difficult, thought provoking questions. It isn't easy, is it? I admire your courage for keeping at it. Thanks for reading and for the great insight. You described the fog so well. Thank you for sharing. Of course. Thanks for reading and interacting. This is something we all need to hear and remember. It’s intense. It’s agonizingly slow. Seems like forever. When will we ever be on the other side of the storm? Praying for strength, patience, endurance. We are 2 years in and it’s still slow and painful. At times I feel like giving up. At times I am so full of hope I can’t imagine life without him. “If you’re going through hell, keep going.” -Winston Churchill. Thank you Anna. You described the journey well. I am glad you have stuck with it and are "still going". Best to you and I will take a heart emoji any day. Yes, same Elizabeth. Still walking through this, just like you. I just told my husband this morning how grateful I was that he is here. I would like to have a cup of coffee as well! Two years into this and it’s still like driving through the fog. At times the fog lifts slightly and it feels like we may be on the other side of it... but then something triggers us and we end up in the thick of it again. Thank you for writing this, Elizabeth. I relate to so much of what you write about. My husband has called me names and said things to me that I never dreamed he would ever say... but then, I never dreamed I would do the things I did. Now I feel like I don’t even have a right to get mad at him for anything at all. I am just so thankful that he is still with me. But we are not through it yet. Praying for strength, patience and endurance. We're about 15 months past D-Day. I (the unfaithful) also told myself early on that maybe it would be best if I left. I told my wife I didn't want to hurt her anymore, so maybe I should just go. But it was all lies that I told myself...excuses so that I could go be with my AP. It was my kids and the thought of what everyone would think (and know) about me that kept me. And I'm glad I stayed. I would have lost out on so much with my wife if I had given in to the fog. Being pretty much out of the fog now, I can see my wife for what she truly is...amazing. Bottom line: don't make decisions when you're in the fog. Great advice. Thanks for sharing your story and your perspective for others to see. And I love hearing how amazing your wife is..those are great words. Grateful that God gives us all new eyes to see and that we don't have to stay stuck and blind if we are willing to own our failure. Great analogy ... and yes you are spot on about time line and how hopeless it gets as we progress. Thanks for a well written piece. Love it! Sigh. Thank you for this article written from the perspective of the unfaithful. Everything you said describes our current situation. It feels like it will be forever to recover from this but another side of me knows it can't be. Every day is so impossibly hard. Every attempt at coming together for dinner or a show or something OTHER than pain and recovery and infidelity discussions is so tinged with pain and anger and I come away even more discouraged. The trauma my wife experienced deepens, her anger intensifies. As you said, each thing I say or do is wrong - damned either way, which feels so hopeless. I will keep driving slowly through the fog, lights on low, with a belief that there will be an end and sunlight on the other side. There will come a day, probably further off than you want, that you will see your wife soften. It might be a long time and that's okay. Keep staying the course. All of us that have gotten to the other side have felt exactly what you've felt. Keep staying the course and showing her that you can do hard things. That she's worth it. Your articles are simply amazing and hopeful. I would love to see you do videos similar to Samuel's but for the unfaithful ladies. I love your perspective and honesty and feel that there are more of us out there who could use someone like you to relate to and not feel so isolated. Thanks again. I think I just replied to another comment by you so I appreciate how much you must be trying to search this site and grow! Have you taken HFH or thought about it? If not, I would consider that class because it will be full of women like me and you. I have taken it, mentored it, and now lead it. It is a great avenue for me to not feel the shame and isolation. As far as the videos, I live too far from Texas to do those but thanks for the encouragement. Until then, I will try to keep writing and encouraging you from afar. Why is Hiding So Tempting?